Discussion in 'Software, Computers, CMC's Techie Stuff' started by Larry Peterson, Nov 22, 2011. It seems like there lists of everything (thank you very much Mr Letterman). Not to be left out Smart Planet gives us the 25 worst passwords of 2011. OK, people, fess up. Who among us has used one of these? We have passwords on our print ordering kiosks, mainly so we know when a person is done ordering. So when they ask for the password it's 1234. Always good for a chuckle. Ever wonder why I changed the logon from framer to UzZx32QU ? Because UzZx32QU was the server root password that got posted by mistake. I was wondering where that came from! Did hackers already made a tool to enter a WPA2-protected network? letmein was an old nerd password back when very few things were passworded! 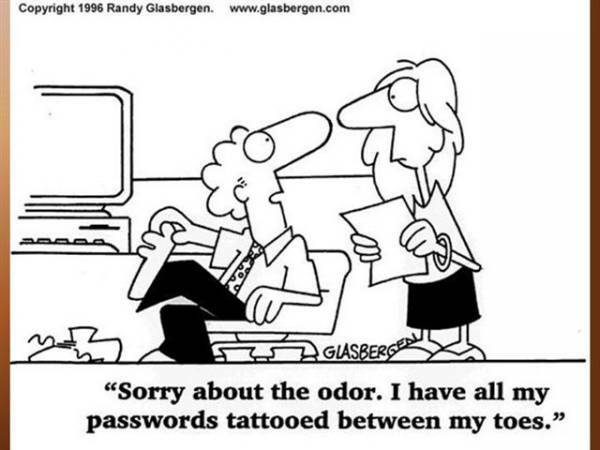 Most of those passwords wouldn't pass muster for most systems! Here's a strong one for you Bob. Nice use of upper/lower case mixed w/ numbers & characters. Jeff if people knew you they would never be able to guess your password of "Obama~2012"
WHAT? No "open ses a me! Everyone knows it's "Open sez me"
Collector of big boys toys: 53 Ford F-100, 34 Chevy hot rod, 02 T-Bird, 57 Chevy Bel-Air hardtop, Hurricane Deck boat, smaller stuff. Mine is "Ifurgotmypasswurd". However, I can never remember it. Through my credit card processor, I can access reports and summaries on “Client Line”. The problem is that their requirement are, IMO, a bit silly. It must be ten characters long; there can be no double letters (e.g. Bill); have at least one capital letter; and it must contain non sequential numbers. That means I can’t use an easily remembered password, so I almost need to write it down … which, of course, defeats the whole purpose. But, the real problem is that if I don’t log into Client Line at least every 14 days, they reset my log in information automatically, which means that I have to fill out a new applications with the merchant account #, T.I.N., routing numbers, credit terminal I.D., etc., each time. AND, my new password has the same requirements as before, but can’t be the same one I previously used. It doesn’t make sense to me. No one can transfer money into or out of the account. All they can do is look up historical information. Such a complex sign in procedure seems to me to be way over the top. I forced my credit card processor to send me paper statements, because try as I might, I could not get into their online system. While I was struggling to come up with a new password, the fleeting seconds they gave me before their temporary one would expire and I would have to start from scratch. So now, because it takes both them and my bank so long to post the monthly charges, I go for about a week and a half at the beginning of each month not knowing what my bank balance is exactly and filling out the register in pencil with an assumed number, which BTW, is always way off because they throw so many new charges in every month. I saw on a TV game show once, they asked what was the most common password and the options were password, 123456 and iloveyou and they claimed it to be 123456. I have always seen password as #1 year after year. Pretty much the same as last year except Jesus has broken the top 25 this year making an appearance at #21. Ninja, welcome and mustang have also made the list. Among those dropping of of the top 25 are qazwsx (the two left columns on the keyboard), superman,654321 and passw0rd. Mine is easy..it's " Iforgetit" OH, OH, now I'll have to change it to "Iforgotit" since you all know it now. Roboform takes care of both those problems for you. And, it will remember any password entered, by site, and automatically fill in username and pw when you go to that site. It will also store your name, address, bank and CC info for filling forms. You can even use it as a sort of "favorites", as there is a toolbar in your browser and as you start typing it will show you a list of Passcards. When you see the one you want press Enter, and it goes to the page, fills in the fields and submits it for you. It also has "Safenotes" - a place to store notes about anything, like maybe info that you need for a site but isn't a field that can be filled in and saved. All this info is stored on your local hard drive and password protected by a Master Password. If you want, you can also set up an online account and have it synced to your computer, where you can also log in from any computer and access the info - handy for when you're at the in-laws and need something. You can also have it synced across multiple computers as well as handheld devices such as a phone or tablet. Here's a helpful article on choosing a password. It has some other good tips, too. So, do you guys have a lot of folks trying to break into your computer? Or your bank account? Or even your car? I know crime is totally random, but am I more likely to be struck by lightning? My Bad. I forgot to update this in 2012. I guess I was busy trying to remember the 3,456 passwords I use. Some of the new ones have gotten really creative...............................NOT. But he was using 1ReallyBadPassword! How did they guess it? That's 18 letters! My passwords look like this, OH52k3V8odths I got fed up of my Microsoft passwords getting hacked, strangely enough nothing has been hacked since I went to this random system. Using the key word "picture": P)I*C#T%U&R$e3 or P_I(C^T^U*r5e4 ....as as "reminder" for either or both of these, I would use "Pe"
Using the key word "vacuseal": V$A!C#U&S@E#A!l9 or V&A#C^U*S$E$A#l- ....as a "reminder" for either or both of these, I would use "Vl"
Using the key word "peterson": P)E#T%E#R$S@o9n6 or P_E$T^E$R%S$O)n9 .... as a "reminder" for either or both of these I would use "Pn"
Unfortunately there are no universal standards for passwords. The number of characters and types of characters vary widely. Some require upper and lower case, some don't. Some require special characters, others don't and some restrict special characters to a specific set. Some require numbers, some don't. Most have limits on the number of characters. Last Pass makes passwords easier. I like it, but wonder about unforseen issues. Any password can be hacked with decryption software. All of those special characters and numbers are simply ASCII codes just like any letter. The only thing that slows hacking down is the number of characters. A sentence that you can remember is just as valid as those random character passwords. And here's an uplifting thought ... encryption's root word is crypt. Famous quote from bureaucrats: "A word which shall live in euphemy." I use Roboform password manager. It has a generator where you can select the length and complexity (Upper Case, lower case, digits and Special Characters [and you can select which SCs you want, which is good, since some sites limit which ones are acceptable]). I generally use 12 characters as long as the site supports it. While I understand that all characters are just that, my supposition for making the password as complicated as possible is that many hackers will likely take the route of least resistance: words and short common phrases such as those in the "most common passwords" list. For one, it would seem foolish to me to go right to checking "e$Fa_%4D" rather than "password". While I use the password generator for most things, I do use easier to remember passwords for things where the password manager is not always easily accessible (for instance, if I want to be able to log in from a public computer, or sites that use pages/forms that are not recognized by Roboform and it won't save info). What I do is use a combination of numbers and words, and mix up the case. For instance, if I wanted to use my car as a password my 2006 Porsche Boxster could become 2)poRSchboXSteR)6. ** The password must contain at least one UPPER CASE letter. *** The password must contain at least one number. *** That password is already in use. Mike Labbe, tedh and Larry Peterson like this. And here we go with the list for 2018. Anyone seeing a pattern here. Must be a few republicans using #23.